This article is about an Indian musical instrument. For other uses, see Veena (disambiguation). 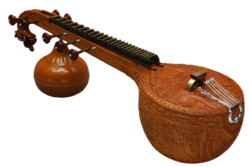 The veena (IAST: vīṇā), comprises a family of chordophone instruments of the Indian subcontinent. Ancient musical instruments evolved into many variations, such as lutes, zithers and arched harps. The many regional designs have different names such as the Rudra veena, the Saraswati veena, the Vichitra veena and others. The North Indian design, that has been used in classical Hindustani music, is a stick zither. About 3.5 to 4 feet (1 to 1.2 meters) long to fit the measurements of the musician, it has a hollow body and two large resonating gourds under each end. It has four main strings which are melody type, and three auxiliary drone strings. To play, the musician plucks the melody strings downward with a plectrum worn on the first and second fingers, while the drone strings are strummed with the little finger of the playing hand. The musician stops the resonating strings, when so desired, with the fingers of the free hand. In modern times the veena has been generally replaced with the sitar in north Indian performances. The South Indian veena design, used in classical Carnatic music, is a lute. It is a long-necked, pear-shaped lute, but instead of the lower gourd of the north Indian design it has a pear shaped wooden piece. It too, however, has 24 frets, four melody strings, three drone strings, and played quite similar. It remains an important and popular string instrument in classical Carnatic music. As a fretted, plucked lute, the veena strings can produce pitches in full three octave range. The long hollow neck design of these Indian instruments allow portamento effects and legato ornaments found in Indian ragas. It has been a popular instrument in Indian classical music, and one revered in the Indian culture by its inclusion in the iconography of Saraswati, the Hindu goddess of arts and learning. These continue to be used, albeit with different designs, in Carnatic classical music and Hindustani classical music. The Sanskrit word veena (वीणा) in ancient and medieval Indian literature is a generic term for plucked string musical instruments. Veena is mentioned in the Rigveda, Samaveda and other Vedic literature such as the Shatapatha Brahmana and Taittiriya Samhita. In the ancient texts, Narada is credited with inventing the veena, and is described as a seven string instrument with frets. According to Suneera Kasliwal, a professor of Music, in the ancient texts such as the Rigveda and Atharvaveda (both pre-1000 BCE), as well as the Upanishads (c. 800–300 BCE), a string musical instrument is called Vana, a term that evolved to become Veena. The early Sanskrit texts call any stringed instrument as Vana, and these include bowed, plucked, one string, many strings, fretted, non-fretted, zither, lute or harp lyre style string instrument. The Natya Shastra by Bharata Muni, the oldest surviving ancient Hindu text on classical music and performance arts, discusses Veena. This Sanskrit text, probably complete between 200 BCE and 200 CE, begins its discussion by stating that "the human throat is a sareer veena, or a body's musical string instrument" when it is perfected, and that the source of gandharva music is such a throat, a string instrument and flute. The same metaphor of human voice organ being a form of veena, is also found in more ancient texts of Hinduism, such as in verse 3.2.5 of the Aitareya Aranyaka, verse 8.9 of the Shankhayana Aranyaka and others. The ancient epic Mahabharata describes sage Narada as a Vedic sage famed as a "vina player". The Hindu goddess Saraswati with veena instrument. The oldest known Saraswati-like relief carvings are from Buddhist archaeological sites dated to 200 BCE, where she holds a harp-style veena. The Natya Shastra describes a seven string instrument and other string instruments in thirty five verses, and then explains how the instrument should be played. The technique of performance suggests that the veena in Bharata Muni's time was quite different than the zither or the lute that became popular after Natya Shastra was complete. The ancient veena, according to Allyn Miner and other scholars, was closer to a harp. The earliest lute and zither style veena playing musicians are evidenced in Hindu and Buddhist cave temple reliefs in the early centuries of the common era. Similarly, Indian sculptures from the mid 1st millennium CE depict musicians playing string instruments. By about the 6th century CE, the goddess Saraswati sculptures are predominantly with veena of the zither-style, similar to modern styles. The Tamil word of veena is yaaḻ (யாழ்) (often written yaazh or yaal). It is in the list of Musical instruments used by Tamil people in Tirumurai dated 6th to 11th century. A person who plays a veena is called a vainika. One of the early veenas used in India from early times, until the Gupta period was an instrument of the harp type and more precisely of the arched harp. It was played with the strings being kept parallel to the body of the player, with both hands plucking the strings, as shown on Samudragupta's gold coins. At a first glance, the difference between the North and South Indian design is the presence of two resonant gourds in North, while in South instead of the lower gourd there is a pear shaped wooden body attached. However, there are other differences, and many similarities. Modern designs use fiberglass or other materials instead of hollowed jackwood and gourds. The construction is personalized to the musician's body proportions so that she can hold and play it comfortably. It ranges from about 3.5 to 4 feet (1 to 1.2 meters). The body is made of special wood and is hollow. Both designs have four melody strings, three drone strings and twenty four frets. The instrument's end is generally tastefully shaped such as a swan and the external surfaces colorfully decorated with traditional Indian designs. The melody strings are tuned in c' g c G (the tonic, the fifth, the octave and the fourth), from which sarani (chanterelle) is frequently used. The drone strings are tuned in c" g' c' (the double octave, the tonic and the octave). The drones are typically used to create rhythmic tanams of Indian classical music and to express harmony with clapped tala of the piece. The main string is called Nāyakī Tār (नायकी तार), and in the Sarasvati veena it is on the onlooked's left side. The instrument is played with three fingers of the right (dominant) hand, struck inwards or outwards with a plectrum. The bola alphabets struck in the North Indian veena are da, ga, ra on the main strings, and many others by a combination of fingers and other strings. The veena settings and tuning may be fixed or adjusted by loosening the pegs, to perform Dhruva from fixed and Cala with loosened pegs such that the second string and first string coincide. One of the earliest description of the terminology currently used for veena construction, modification and operation appears in Sangita Cudamani by Govinda. A Rudra veena, now at Musée de la musique, Philharmonie de Paris. Rudra veena is a fretted veena, with two large equal size tumba (resonators) below a stick zephir. This instrument is played by laying it slanting with one gourd on a knee and other above the shoulder. The mythology states that this instrument was created by god Shiva It may be a post-6th century medieval era invention. According to Alain Daniélou, this instrument is more ancient, and its older known versions from 6th to 10th century had just one resonator with the seven strings made from different metals. Saraswati veena is another fretted veena, and one highly revered in Indian traditions, particularly Hinduism. This is often pictured, shown as two resonators of different size. This is played by holding it at about 45 degree angle across one's body, and the smaller gourd over the musician shoulder. This instrument is related to an ancient instrument of South India, around the region now called Kerala, where the ancient version is called Nanthuni or Nanduruni. Vichitra veena and Chitra veena or gottuvadhyam do not have frets. It sounds close to humming human singer. The Vichitra veena is played with a piece of ovoid or round glass, which is used to stop the strings to create delicate musical ornaments and slides during a performance. Sitar is a Persian word meaning three strings. Legends state that Amir Khusro of Delhi Sultanate renamed the Tritantri veena to sitar, but this is unlikely because the list of musical instruments created by Akbar historians makes no mention of sitar or sitariya. The sitar has been popular with Indian Muslim musicians. Saradiya veena, now called Sarod. Pinaki veena, related to Sarangi. Kachapi veena, now called Kachua sitar. ^ a b Lochtefeld 2002, pp. 753–754. ^ a b c d e Dorothea E. Hast; James R. Cowdery; Stanley Arnold Scott (1999). Exploring the World of Music: An Introduction to Music from a World Music Perspective. Kendall & Hunt. pp. 151–152. ISBN 978-0-7872-7154-1. ^ Tutut Herawan; Rozaida Ghazali; Mustafa Mat Deris (2014). Recent Advances on Soft Computing and Data Mining. Springer. p. 512. ISBN 978-3-319-07692-8. ^ a b c Ritwik Sanyal; Richard Widdess (2004). Dhrupad: Tradition and Performance in Indian Music. Ashgate. pp. 23–25. ISBN 978-0-7546-0379-5. ^ a b c d Randel 2003, pp. 819–820. ^ a b Rowell 2015, pp. 33, 86–87, 115–116. ^ a b c Allyn Miner (2004). Sitar and Sarod in the 18th and 19th Centuries. Motilal Banarsidass. pp. 26–27. ISBN 978-81-208-1493-6. ^ Suneera Kasliwal (2004). Classical musical instruments. Rupa. pp. 70–72, 102–114. ISBN 978-81-291-0425-0. ^ Te Nijenhuis 1974, pp. 17–22. ^ a b Beck 1993, pp. 108–112. ^ a b A Madhavan (2016). Siyuan Liu (ed.). Routledge Handbook of Asian Theatre. Routledge. pp. 131–132. ISBN 978-1-317-27886-3. ^ Bettina Bäumer; Kapila Vatsyayan (1988). Kalatattvakosa: A Lexicon of Fundamental Concepts of the Indian Arts. Motilal Banarsidass. pp. 135–136. ISBN 978-81-208-1402-8. ^ Dalal 2014, pp. 272–273. ^ a b Catherine Ludvík (2007). Sarasvatī, Riverine Goddess of Knowledge: From the Manuscript-carrying Vīṇā-player to the Weapon-wielding Defender of the Dharma. BRILL Academic. pp. 227–229. ISBN 90-04-15814-6. ^ Rowell 2015, pp. 114–116. ^ Rowell 2015, pp. 98–104. ^ ""The Coin Galleries: Gupta: Samudragupta"". ^ a b Nettl et al. 1998, pp. 352–355. ^ Caudhurī 2000, p. 79. ^ Caudhurī 2000, pp. 26–27. ^ Rowell 2015, pp. 153–164. ^ Caudhurī 2000, pp. 111–113. ^ Gautam 1993, p. 9. ^ Martinez 2001, pp. 127–128. ^ a b c Sorrell & Narayan 1980, pp. 48–49. ^ a b Suneera Kasliwal (2004). Classical musical instruments. Rupa. pp. 116–124. ISBN 978-81-291-0425-0. ^ Suneera Kasliwal (2004). Classical musical instruments. Rupa. pp. 117–118, 123. ISBN 978-81-291-0425-0. ^ a b Caudhurī 2000, p. 179. ^ Caudhurī 2000, p. 65. ^ Caudhurī 2000, p. 66. ^ Caudhurī 2000, p. 176. ^ Caudhurī 2000, p. 177. Beck, Guy (1993). Sonic Theology: Hinduism and Sacred Sound. Columbia: University of South Carolina Press. ISBN 978-0-87249-855-6. Caudhurī, Vimalakānta Rôya (2000). The Dictionary of Hindustani Classical Music. Motilal Banarsidass. ISBN 978-81-208-1708-1. Dalal, Roshen (2014). Hinduism: An Alphabetical Guide. Penguin Books. ISBN 978-81-8475-277-9. Gautam, M.R. (1993). Evolution of Raga and Tala in Indian Music. Munshiram Manoharlal. ISBN 81-215-0442-2. Kaufmann, Walter (1968). The Ragas of North India. Oxford & Indiana University Press. ISBN 978-0-253-34780-0. OCLC 11369. Lal, Ananda (2004). The Oxford Companion to Indian Theatre. Oxford University Press. ISBN 978-0-19-564446-3. Lochtefeld, James G. (2002). The Illustrated Encyclopedia of Hinduism, 2 Volume Set. The Rosen Publishing Group. ISBN 978-0-8239-2287-1. Vatsyayan, Kapila (2008). Aesthetic theories and forms in Indian tradition. Munshiram Manoharlal. ISBN 978-81-87586-35-7. OCLC 286469807. Wikimedia Commons has media related to Veenas.